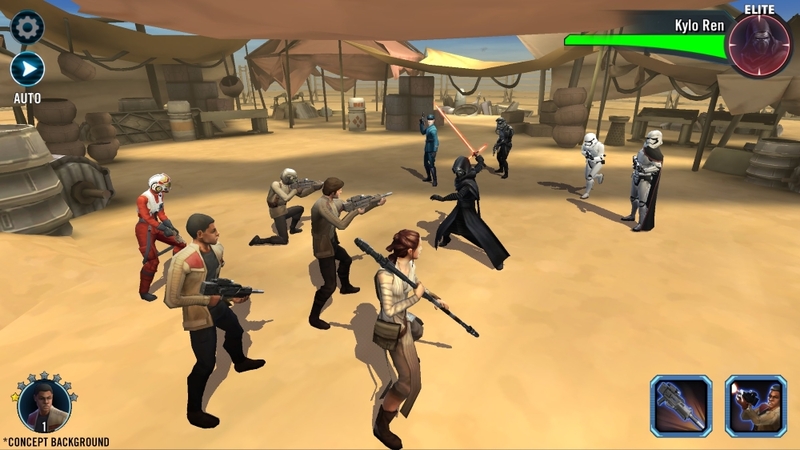 Star Wars Galaxy of Heroes is a mobile game for iOS and Android. It is free to play but offers a pay with cash in game currency. It is a “progress” based casual game where the primary objective is leveling up so you can tackle ever-increasing challenges. The primary game mechanic is turn-based JRPG combat where two teams of characters stand across from one another and trade attacks. The theme is, of course, Star Wars and play involves collecting and leveling up characters from the movies, TV shows, and other media sources. Some of the characters are named while others are representative of the rank and file military personnel from the universe. Thus your squad might have Grand Moff Tarkin fighting alongside an unnamed Snowtrooper. There are also iconic ships you can collect and battle with in a similar fashion. Like many progress casual games, there is a wide range of variations on the core combat mechanic and many details to the character leveling process. The farther you advance, the more avenues of character advancement and types of challenges become available. There are various fixed scenarios based on scenes and settings from the films as well as the ability to battle AI-controlled versions of other player’s teams. There is no central narrative or story for the game. The UI is presented as stations in a cantina, thus the battles you engage in are essentially games within the game. The characters do not have personalities or dialog, they are simply a collection of stats and abilities along with an avatar. Some characters have multiple versions. For instance, Luke could be the clone wars version, his movie Jedi version, or one based on his life on Tatoeen. I like tactical and strategic gameplay and the JRPG combat system and setting attracted me enough to try this game out. I’ve played a few progress oriented games now and my issue with most, this one included, is the central leveling mechanics means only rarely are you placed in challenges where skill is the primary factor in determining a win. Typically you are either wholly dominating your enemy, or being hopelessly crushed. Only on the rare occasions, you are perfectly matched with a challenge can you feel like the choices you make in combat are meaningful to the outcome. The strategic side of the game is a bit better. Once you have a dozen or so heroes you can start to make choices about which ones to include on a team. There are some meaningful combos between abilities that can lead to teams focused on offense or defense or some blend of the two. The more characters you unlock, the richer this aspect of the game gets. For this reason, and because customization of your heroes is limited to making them numerically superior, I found gameplay uninspiring. I rarely gave the game any thought when not playing it. That said, the leveling mechanics are well designed and it does keep you busy and engaged doing all the things you need to do in order to level up and get new characters. As progress games go, it’s solidly designed and executed. My only real disappointment with the game were the graphics and sound. Something about the art design doesn’t quite sit well. Perhaps it’s the effort to give it the feel of a Star Wars hologram game, perhaps it’s just a low poly count on the characters. While they all are distinctive and look like the characters they represent, I never looked at a character and felt a real emotional connection or sense of them being cool. They are too devoid of personality for a setting that is so rich in personality. The sound design isn’t bad, just very limited. You get some Star Wars orchestral background music, and a whole host of beeps and blasts consistent with film folio. There are however no real voices or vocalizations for the characters, not even grunts or growls for the monsters. Again, this drains a lot of personality from a game set in the Star Wars universe. If you like casual progress games, it is worth trying out. The mechanics are competent and you can certainly play it without paying anything. Ultimately I decided to review it and take it off my iPad. I enjoyed it but it didn’t quite rise to the level of compelling.